REO. U. S. PAT. OFF. gumbo in .spring and summer. Ord•r by Catalog Number b•low. Stole size. still rationed and a ration certificate is required. will fill your orders without a (trti.ficate. tires and all inner tubes are ration-free. inspected at an authoriztd OPA Tire Inspection Station. spection Record to your local Ration Board. .Certificate, properly signed, to us with your order for ALLSTATE tires. conforming to Tire and Rim Association standards. longei--givcs you better wear from both tire and tube. get the best quality ••• install AusrATE Full Circle Molded Inner Tubes. long, trouble-free service; to hold air for a long time. tube to wrinkle or pinch even under the toughest driving conditions. 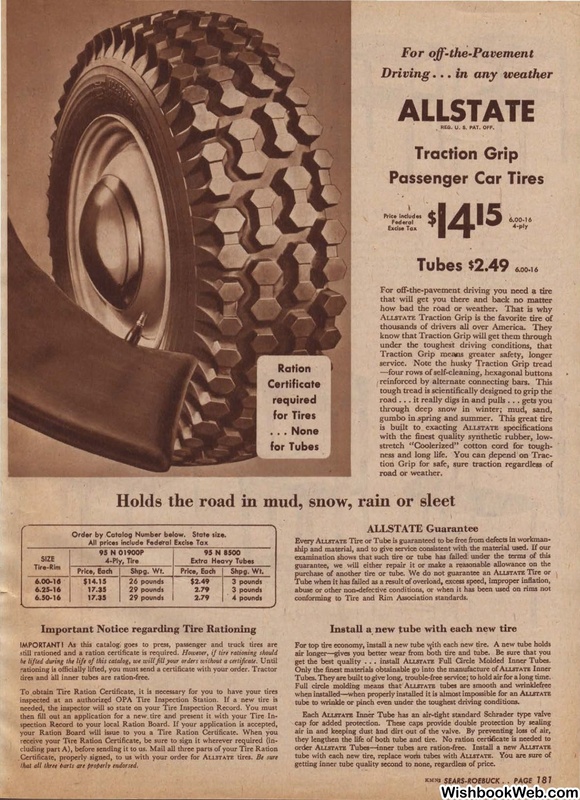 tube with each new tire, replace worn tubes with ALLSTATE. getting inner tube quality second to none, regardless of price.